Going to El Nido soon? I've gathered all the pieces of my own experiences I wrote from my previous blog posts in one to accommodate your precious time better. 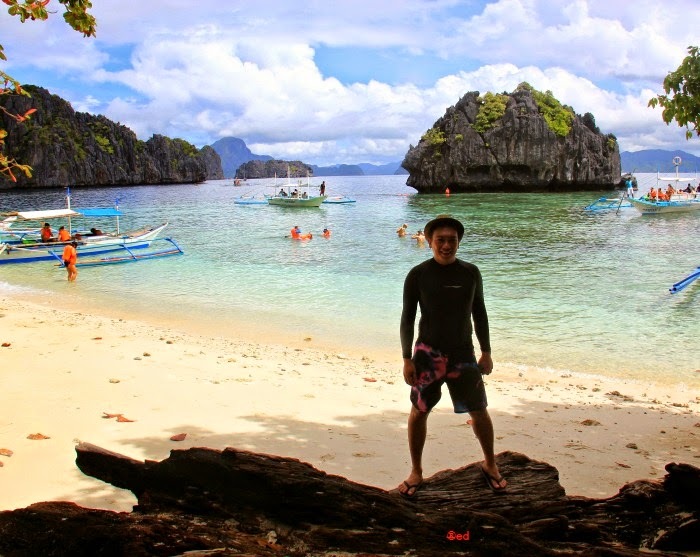 With numerous inquiries coming from friends and colleagues who knew I'm from Palawan, I find it best to summarize my experiences here, so I could've just send you this link, lol! I hope you'd be able to find this travel guide helpful when you visit my favorite town in Palawan. Of course, I am pleased to accommodate your questions or should you have further clarifications. Arrival from Puerto Princesa Airport at 8 AM. Ride a van directly going to the Municipality of El Nido. Scheduled every hour, air-conditioned vans are stationed at the new terminal in Barangay Tiniguiban. 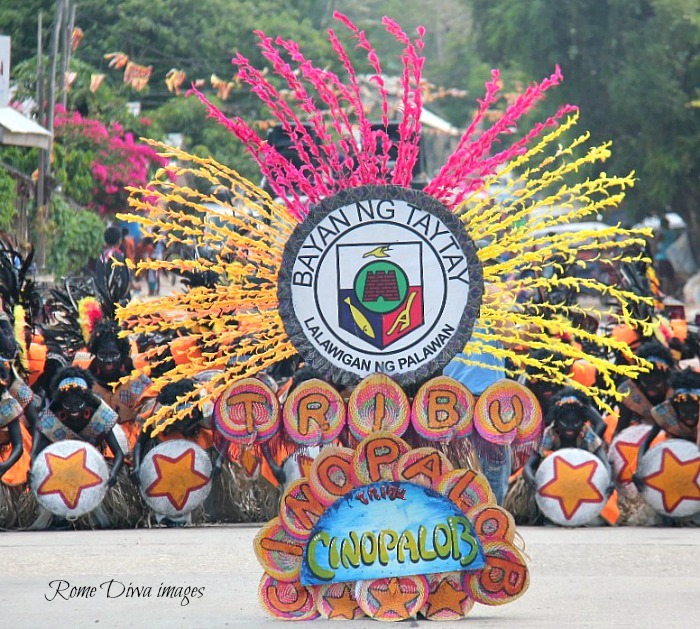 Time of travel is approximately 4-6 hours from the city to El Nido town. • Lunch at the hotel. 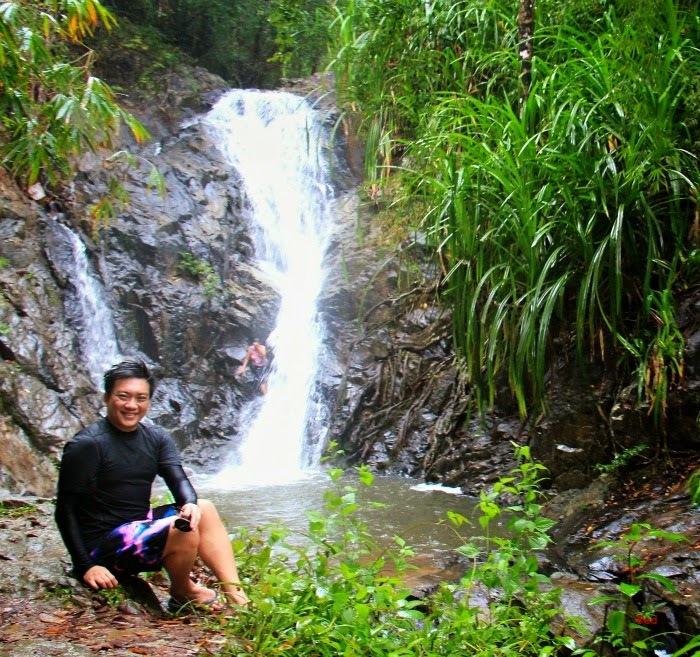 • Choice of (1) Nagkalit-Kalit falls hiking and visit to inland beach, Las Cabanas Beach Resort , (Php 350 pax) or (2) Nakpan Beach. We choose the first, left the apartel after lunch, bought snacks and water from the town proper and off we went to Nagkalit-kalit Waterfalls via tricycle. The road to Nagkalit-kalit Falls was bumpy and muddy 20 minutes tryke ride. One gust of wind and we were drenched in the spray. Still, it was fun accompanied by screams and laughter. Plus, we were treated to wonderful scenery of tropical rain forest and farmlands as we passed through billowing clouds and mists almost covering the distant tropical forest. 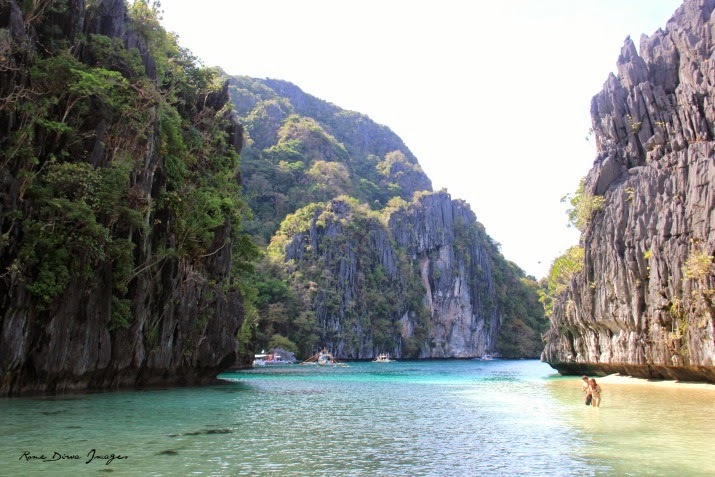 "El Nido has some jungle with untouched rainforests, vast mountain ranges and not just limestone-surrounded lagoons and long stretch of beaches", I said to myself. Warning: This little adventure is not for the faint-hearted: the walks cover rocky and muddy (on rainy days) terrain, steep climb and crossing a total of 7 rivers and streams for thirty to forty-five minutes to reach the falls. You need to be physically and mentally prepared to climb carrying your belongings in a rucksack in trying circumstances. It can be tough, slippery and involve some scrambling, so prepare to get your hands dirty and your muscles stretched. (Read my complete experience and view more pictures here). 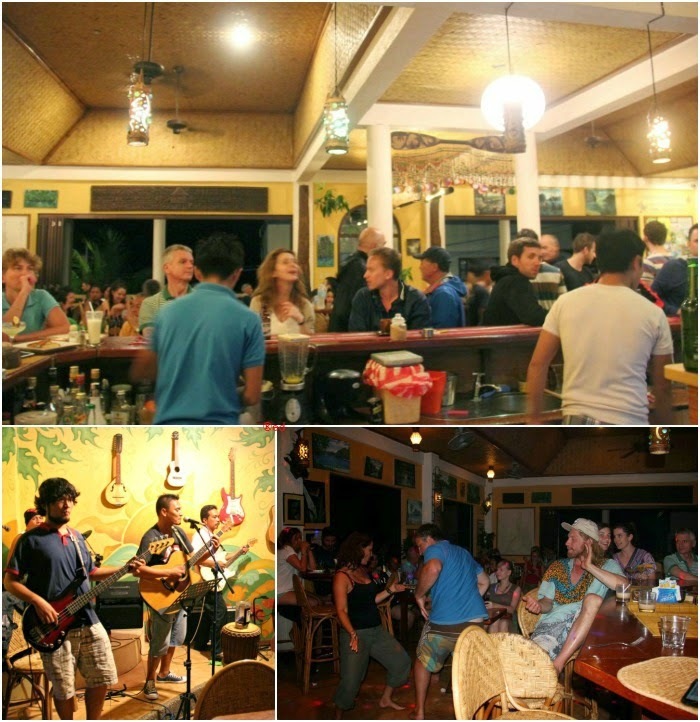 • Las Cabanas Beach Resort - The beach resort doesn't have access directly from the main road. We were told that we need to hike for 5-10 minutes to the beach. Our group hesitated when we saw the muddy road leading to the beach but eventually decided to go through. 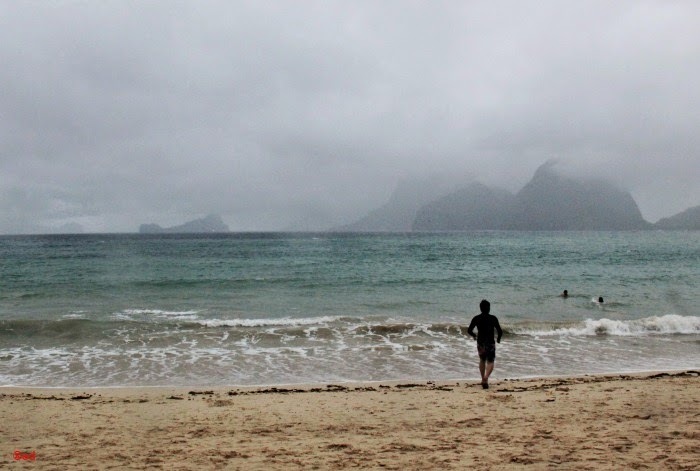 Magnificent silhouette of El Nido's signature limestone cliffs greeted them upon arrival. Trembling in cold, they stayed in the nearby beach bar to rest and ordered coffee. The view gave warm to my heart. 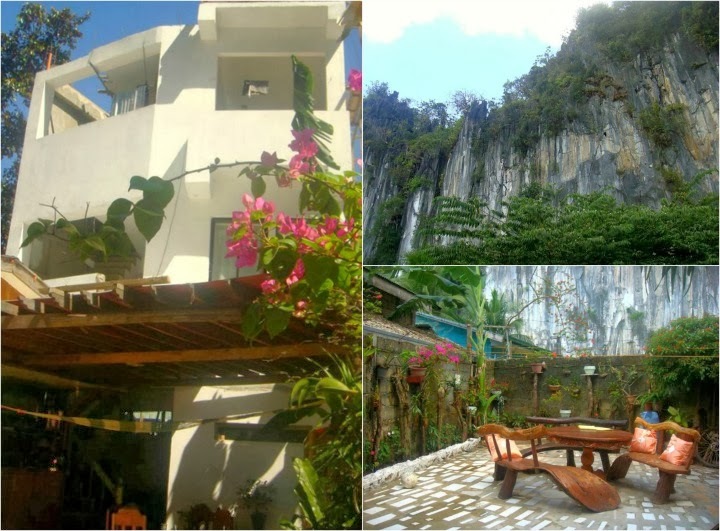 Las Cabanas occupy a great spot in El Nido showcasing glorious stretch of coastline and uninterrupted view of Bacuit Bay. "When not raining, this spot is the best for beach wedding", I though at that moment. (Read my complete experience and view more pictures here). 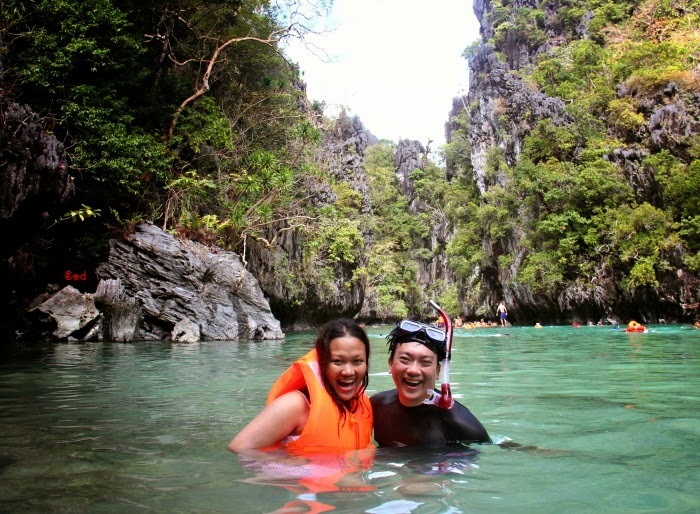 TOUR A, the most famous and the most availed tour package in El Nido A.K.A. "The Lagoon Tour" as it comprised of expedition to 2 lagoons of Miniloc Island - Small Lagoon and Big Lagoon. Secret Lagoon, Shimizu Island, and 7 Commandos Beach are also part of the whole day tour. Costing Php 1200 each, it includes boat transportation, lunch, life jacket and snorkeling equipment, and services of a tour guide. Recommended to rent a kayak for much better experience of exploring the lagoons. • EL NIDO ISLAND HOPPING | TOUR A - Simizu Island - There's long queue of boats heading to the island. It's almost time for lunch and lunch is usually held on this island. Boat crew and tour guides prepared lunch under the shades of trees while their guests were swimming and snorkeling, and sun-bathing. (Read my complete experience and view more pictures here) Check out what’s for lunch here. 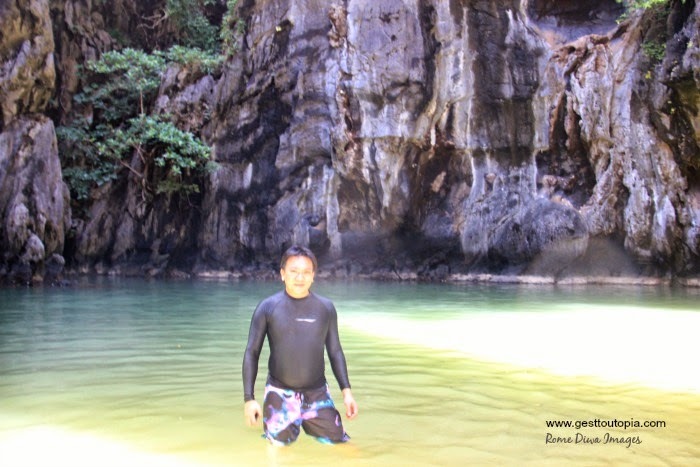 • EL NIDO ISLAND HOPPING | TOUR A - FISH FEEDING AND SNORKELING - Oftentimes, tour operators exclude these cool activities particularly when you are running out of time to go back in mainland. Strong winds and currents normally occur during afternoon, I was told by one of the boatmen and they have to hurry to go back to the port strictly following Philippine Navy's protocol. (Read my complete experience and view more pictures here). 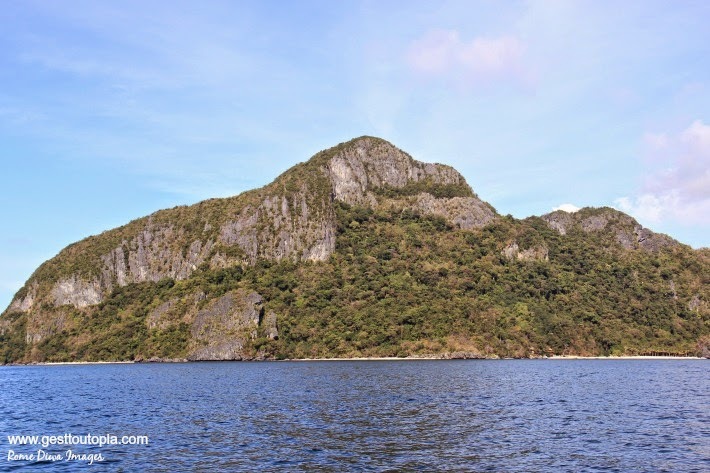 • EL NIDO ISLAND HOPPING | TOUR A - SECRET LAGOON - I was skeptical at first and planning to just wait by the boat and spend more time swimming because of bad experiences I've read online. I tried to convince the first-timer Trixie that it's just a waste of time, nothing to see, but she's very persistent to just see the lagoon. She recalled my promise to be her personal tour guide when we were planning this vacation, so I had no choice but go. (Read my complete experience and view more pictures here). 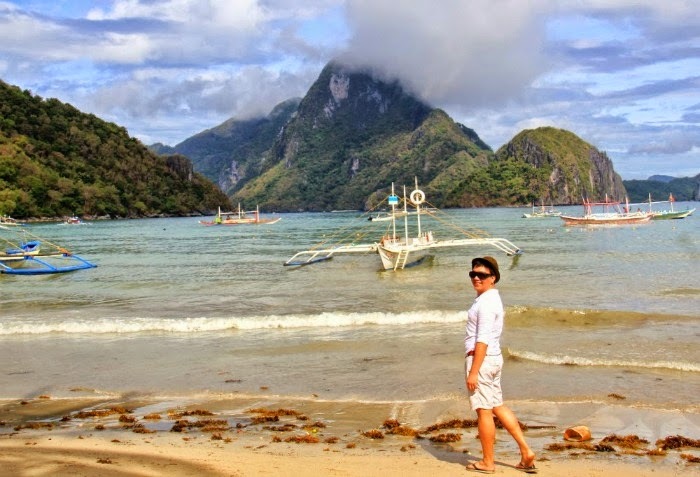 • EL NIDO ISLAND HOPPING | TOUR A - SEVEN COMMANDOS BEACH - It's been a day of island hopping and we headed to our last destination: Seven Commando Beach. This is where we spent the remaining time of the day to relax and cool-off extra adrenaline and enjoy a glass of cold refreshments and food sold at the beach. (Read my complete experience and view more pictures here). 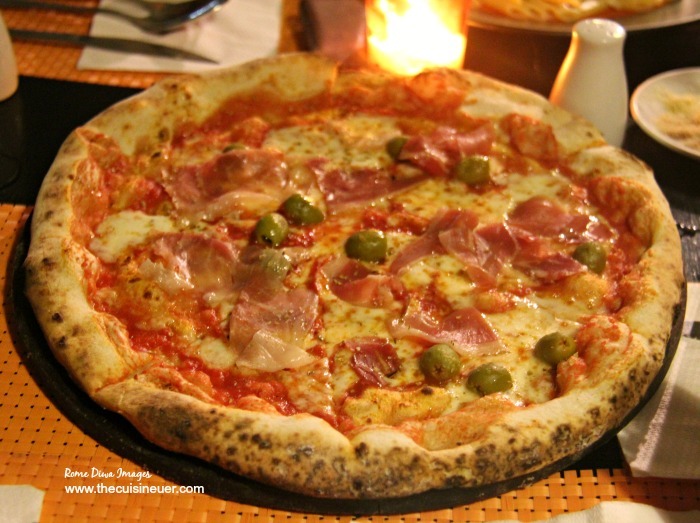 • Dinner at Altrove Trattoria - Should you have a plan to visit El Nido anytime soon, then I guess you already have a list of things to-do, itinerary, and travel guides. Look again and see to it that dining-in at Altrove is included in your list because dining here is an unforgettable gastronomic experience itself. (Restaurant review experience and view more pictures here).